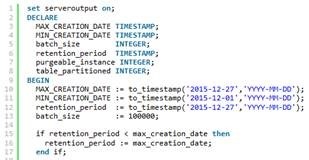 If you are familiar with SOA/BPM 11g purging, after you have upgraded/implemented SOA/BPM 12c, you will not be able to use most of the SQL for 11g to determine the purgeable instances. This is because SOA/BPM 12c is no longer using composite_instance table for composite instance tracking. In SOA/BPM 12c, a common component is used to track the state associated with a business flow and report audit information. This design will reduce the instance tracking data generated and stored in the database, and improve purge performance by minimizing the number of tables that need to be accessed. Component instance state will no longer be stored in individual table for instance tracking purpose, the overall flow state will be stored in SCA_FLOW_INSTANCE table. When the “active_component_instances” value reaches 0, this indicates that the Flow is no longer executing. There is another column called “recoverable_faults”, this column keeps track of how many faults can be recovered. This information together with the “active_component_instances” is used to determine whether the Flow can be purged or not. The SCA_FLOW_ASSOC table is used to record the association between the original Flow that creates the BPEL component instance and the correlated Flow. The SCA_FLOW_ASSOC table is used by the purge logic to ensure that all correlated Flows are purged together when none of the flow is in an active state. You can use the following sample PL/SQL to determine whether the SCA_FLOW_INSTANCE has been partitioned and the number of purgeable flow instances in your SOAINFRA schema. Please read the complete article here.